FAIRCHILD Semiconductor, represented by Arrow Electronics , has announced the FMS6417, a comprehensive video filtering and line driving solution that offers more functionality than competitive parts. 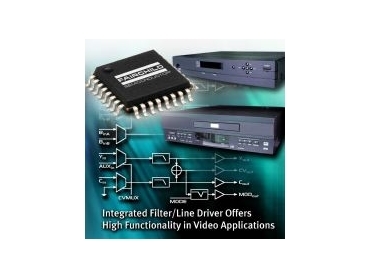 The FMS6417 is a five-channel, video reconstruction filter that includes selectable RGB (YUV) high definition and standard definition (HD/SD) filters with Y, C, composite, and modulator outputs. This integrated product combines video line drivers, sound notch, and multiple video input/output standards, all in one chip. The FMS6417 is suitable for applications such as cable and satellite set top boxes, DVD players, PVRs (personal video recorders), HDTVs, VODs (video on demand) and TVs. With its ability to remove high frequency noise prior to digitising the signal (anti-aliasing) or to remove artefacts introduced during D/A conversion in the encoder (reconstruction), this monolithic device can be used for anti-aliasing or reconstructive (smoothing) filtering for RGB, component, S-video, and composite video signals. The FMS6417 consists of a triple 6th order filter with selectable 30MHz and 8.0MHz frequencies and a dual 8.0MHz filter for filtering Y/C. The filter contains a summing circuit to generate filtered composite video, an audio trap, and group delay compensation circuits to notch-out audio and group delay predistortion for NTSC. In addition, 2-to-1 multiplexers are provided on the triple filters, as well as provisions for auxiliary inputs to the composite channel. The FMS6417 also includes DC-coupled inputs and all outputs can drive ac-coupled, 75Ω loads and provide 6dB of gain. This new video filter is offered in a space and cost saving 32-Pin LQFP package, and is available in tape and reel packaging. Demo boards are available to illustrate the product’s full performance capabilities. The FMS6417 adds to Fairchild's solutions for applications such as set top boxes, DVD players, and HDTVs. These products include data converters, amplifiers, MOSFETs, optocouplers, regulators, LEDs and LED drivers.